How OutBrain Amplifying Content Works? Dreaming of seeing your article featured on the CNN, USA Today, NY Times, or many other big names? Outbrain.com for amplifying content is offering an exciting PPC advertising method, not for ads like Google, Microsoft, and yahoo are doing, but for actual content titles. So, how does Outbrain works? Outbrain is the only content discovery platform dedicated exclusively to the distribution of high-quality content. With Outbrain Amplify, links to your content appear as recommendations on the web's largest content publishers including sites like Wall Street Journal, Reuters & People.com. Plus, Outbrain optimizes on engagement so the more interesting your content and the more traffic you drive, the more you will be recommended around the web. 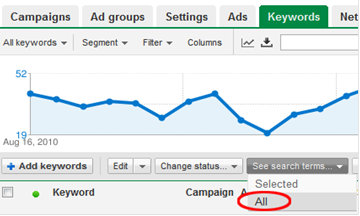 Yesterday I stumbled upon a simple, yet handy, Keyword tool for PPC campaigns called Keyword Wrapper. 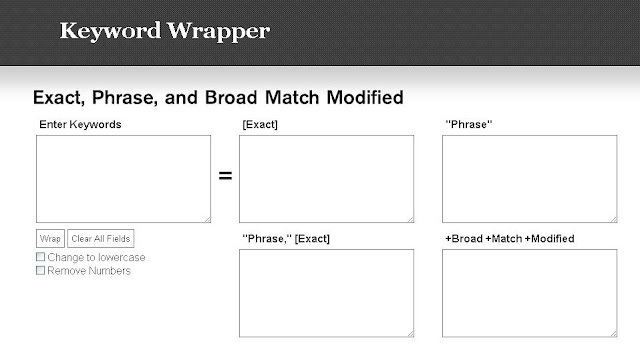 You insert a list of all your keywords as a broad match type and you hit "wrap". The tool will generate 4 lists of keywords with all the match types. 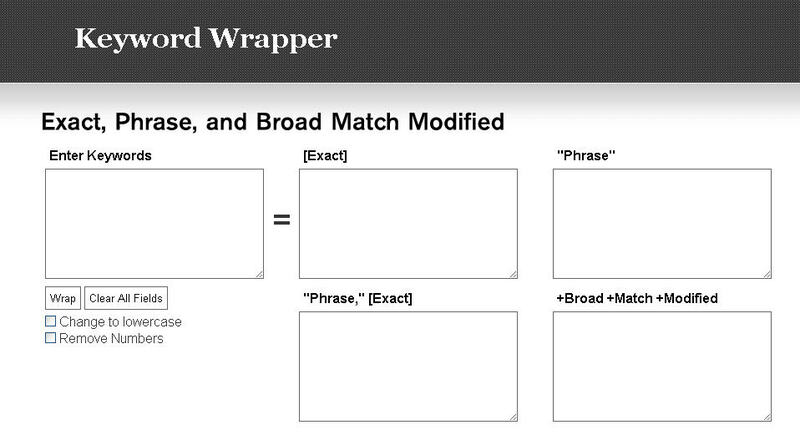 (Phrase, exact, and Broad Match Modifier). Display URL – Use Capitalization in your domain & add your keyword after the /. You can also remove the www from the Display URL if you need the extra room. Last month, Facebook launched a new conversion measurement and optimization system for direct response marketers. Facebook conversion measurement allows advertisers to measure the ROI of their Facebook ads by counting relevant user actions, such as registrations and shopping cart checkouts that are driven by people seeing an ad on Facebook. 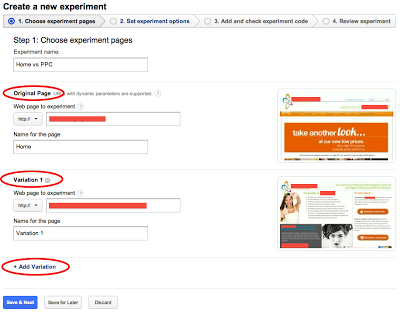 What is Facebook Conversion Tracking? Conversion tracking helps businesses measure the return on investment of their Facebook Ads by reporting on the actions people take after viewing those ads. Advertisers can create pixels that track conversions, add them to the pages of their website where the conversions will happen, and then track these conversions back to ads they are running on Facebook. 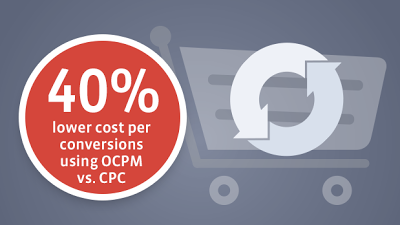 Conversion tracking also helps businesses leverage optimized cost per impressions (oCPM) to show ads to people who are more likely to convert off Facebook. A conversion is an action that a person takes on a website such as checking out, registering, leads, Key page views, adding an item to the shopping cart, or viewing a particular page. Virtually any page on a website can represent a conversion. Facebook tracks conversions that happen within 1 day, 7 days, and 28 days after a person clicks on an ad, and 1 day, 7 days, and 28 days after viewing an ad. Optimized CPM (OCPM) and Conversion Tracking tools are not only used to measure the ROI from Facebook PPC advertising, but are also used to deliver ads to people who are most likely to convert on their websites. Facebook’s Beta tests have shown that when conversion measurement is used with optimized CPM, ads reduced the cost per conversion by 40 percent when compared to CPC ads using the same budget. That is extremely valuable for marketers in e-commerce, retail, travel, financial services, and other direct-response industries that value actions taken on their websites. Facebook ad manager will monitor which ads are generating more conversions and which users are more likely to convert from specific ad copies (e.g. Ad X drove Y sales). Then you can increase the CPC (or CPM), optimize the conversions page, adjust the ad copy, or even change the marketing strategy. If you have an active website with pictures (photos) more than text content, and you choose to monetize these images, "Luminate" systems will review them and match the image to compatible advertising campaigns running. Overlay advertising is available for all approved publishers and if your site generates a large amount of traffic, Luminate will contact you directly to set up Luminate premium advertising where their team of experts will tag products in your pictures. The Luminate icon alerts consumers that an image is interactive. 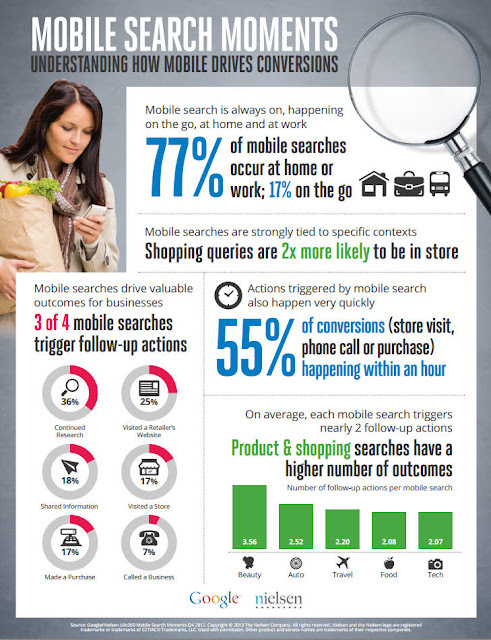 Consumers can access relevant content just by mousing over an image. 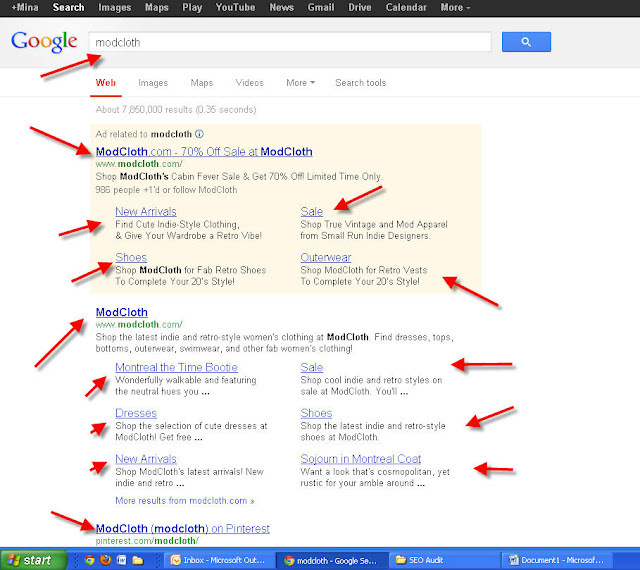 Should I add and pay for my Brand name Keyword on a PPC Campaign? 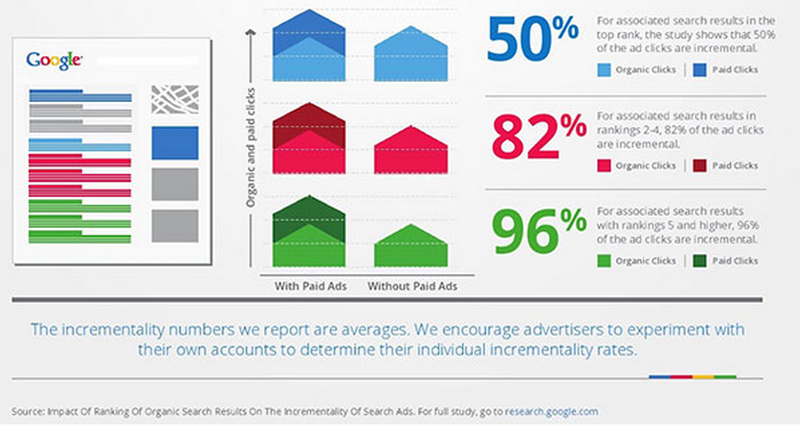 What does it mean to have a PPC Campaign and you are already on top of Google's SERP? How to sell SEO Services to Hard Clients? If you are a sales executive or a business Development Specialist, or an SEO consultant working for an Online Marketing Agency, you might have met that savvy client who has SEO background and cannot accept your “we will make your site better” speech, but needs professionally explained procedures and techniques without being too jargoned at the same time. The language of an SEO consultant is different from that of the business decision maker buying SEO services. To more successfully sell SEO services, consultants can become more fluent in both languages. More directly addressing the points above will curry favor with business decision makers and likely result in more, and higher value, sales. Please don't ask me my budget first thing in the conversation. If you can work with us to deliver ROI, I can deliver budget. If we can't work together to deliver ROI, I can't deliver budget. Since you're unlikely to discuss results this early in the conversation, I'm unlikely to discuss budget this early in the conversation. While you are unlikely to guarantee results, you probably want me to guarantee payment. Let's discuss how we can structure an agreement that will work for both of us. Unless you've made a very strong case for results, I'm more likely to hire you on a project/deliverable basis than a monthly retainer basis, although various structures are possible. Ask me about my business goals and objectives. If you don't understand them, dig into them with me. If you have suggestions or recommendations about my goals, feel free to propose alternative business goals. But before moving on, let's make sure we're both aligned here. Ask me about my existing results. These may be confidential, but I'll tell you what I can, or ask you to sign an NDA, and then tell you what I can. Plus, based on the questions you ask, I'll have a better understanding of how you approach SEO. And of course, knowing such confidential data will make you part of the family. Let's get clear on whether this is an SEO project, or an SEO/conversion/usability project. Although the teams need to work together, each of these areas requires different skills. I often have teams working on these other areas already, and I am looking to add specific SEO expertise into the mix, not broad web site optimization expertise. If you want to pitch me on these other areas, let me know early. In general, I'm looking to bring your SEO expertise into the mix and really want to focus on SEO. I told you our numbers and stats. So please it is your turn to discuss your tactics. Don't tell me "it's a secret". Secret means black hat. Black hat means trouble with google. Trouble with google means I won't hire you. I'm not going to hire you because I hope you know what to do. I'm going to hire you because you've convinced me that you know what to do. Tell me which tactics you've had the most experience and success with and which will most likely be applicable to our situation. You'll qualify yourself by working openly with me and gaining my trust about your tactics. Once you've gained my trust, you have to show me you can operationally execute these tactics. Discuss your methodology. Tell me what steps you'll be going through during the engagement. Bring samples of the reports and deliverables you'll use and provide during the engagement. 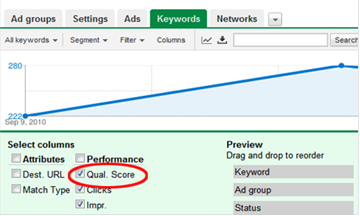 You probably have planning and measurement reports that baseline current results, address keyword selection, plan on-page factors and track ongoing results, among others. A sample project plan would be nice too. If your only competitive advantage is your methodology, and you're unwilling to discuss it, I'm less likely to be convinced that you'll be able to deliver positive results, and less likely to be able to interally sell your capabilities. And I won't know if your methodology is better than the one we're already running internally. 7. Who is the SEO team? Tell me who is going to do the work on this project and put them in front of me. No sense in having the A-team pitches me, and delegating the work to the C-team. Tell me about your in-house training process. This helps me understand that you (a) have a sustainable business that can withstand employee turnover and (b) have a method of keeping up with any of the latest changes in SEO tactics. It's okay if you're a one person shop — then only (b) is important. Without breaching client confidentiality, liberally use examples in your discussions. Statements like "we changed X on a commerce site, and that drove up traffic by Y, and we think a similar tactic could work on your site" helps me better understand the experience upon which you're building knowledge. Be specific about which knowledge is based upon your teams' testing, which knowledge is based upon reputable third party testing, which knowledge is based on accepted folklore, and which knowledge is an educated guess (that you think is worth testing). Estimate business impact. Let me know some of your initial thoughts or recommendations, and the upside we might get from implementing them. Tie this into past improvements you've seen. I know there are no guarantees — there rarely are. 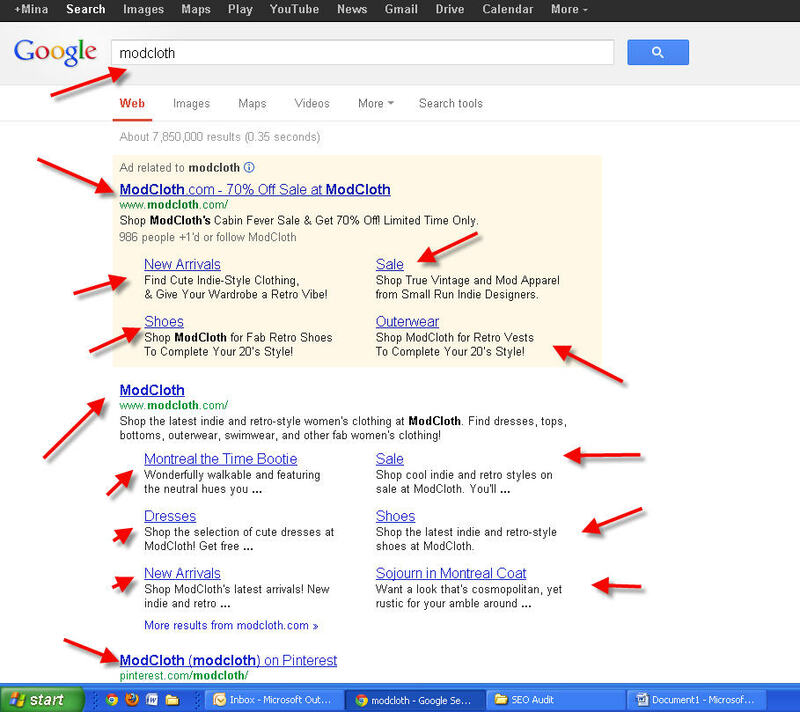 Google may change (a little bit). So, when you provide estimates, estimate low. Under promising and over delivering always makes everyone happy. Engage me in a conversation about our costs of implementation. Some high impact recommendations may be very expensive for us to implement. Some will be less expensive. I need your inputs on the return side; you'll likely need my inputs on the cost side. Prioritize. Let's run through the ideas, prioritize those that have "big impact / low cost", and execute those first. Together, we'll create a top 3-5 list to help me see the fastest, largest ROI, up-front. Tell me when you expect to see positive results. You might say some version of "I need to look at your log files to see how often the pages we are working on will be crawled; we'd expect to see results within 2 weeks of the pages being crawled, which may happen 1 month after the changes launch". Or you might say "With a previous client, we used a similar strategy and generated results of X within Y weeks of launch." If you point out shortcomings in our current SEO efforts, do it constructively. You're going to have to work with the people you're talking to. Good: "You guys have done really well with your in-house efforts. I have some ideas on how to build further on them." Bad: "I don't know how you missed these really basic things". You're selling not just your expertise, but also your ability to make friends with us and work with us. In the medical profession, they call this "having good bedside manner". All other things being equal, good bedside manner trumps. 15. When you talk about such shortcomings, please also share the results we can expect from addressing them. You may find that we already know these shortcomings exist, but have chosen not to prioritize addressing them because of poor ROI. Or, we may learn that you've identified some new areas that do have upside opportunity, which further bolsters your credibility. 16. When is a good time to talk about cost? Generally, you want to sell the business value you can deliver first, then talk about cost. Once I'm confident about the business results we are likely to achieve, I can start estimating value and ROI. Is (Probable Value of Results) > (Cost of Consultant + Cost of Managing Consultant + Cost of Implementing Changes)? I am responsible for allocating limited resources and money to areas that will deliver business results. Having discussed the above with you, I can start comparing the return Cost of Consultant will give me in SEO with the return I can get from other marketing or conversion generation activities. Now I'm ready to think about allocating budget and to talk about money. Sometimes you will find yourself, as an Seo consultant, not addressing a decision maker, like CEO, CMO, or a marketing director. You may be pitching an influencer who could be a junior SEO technician, or a marketing specialist, or maybe someone from the technical guys who created the website or designed it. These guys might get interested quickly but unless you give them a strong reason focusing exactly on the benefits their websites will have if they recommended you and spoke on your behalf to their decision makers. Landing pages are a crucial element of any PPC campaign, so it is important to test them regularly. 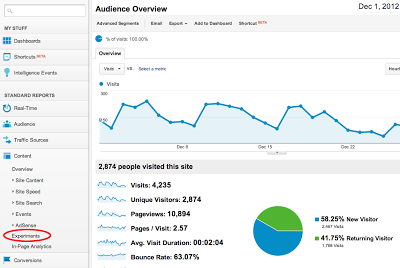 Google Analytics offers up a nice tool to help us testing some items on websites landing pages. 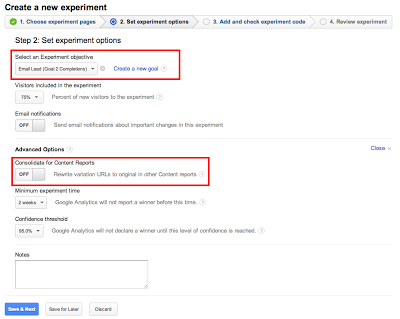 Formerly known as Website Optimizer (standalone product), Analytics Content Experiments is now integrated within Analytics and acts as a tool for testing changes to your landing pages. One of the best parts about this tool is the fact that it automatically reveals if a test is statistically significant based on the KPI you select. 1. 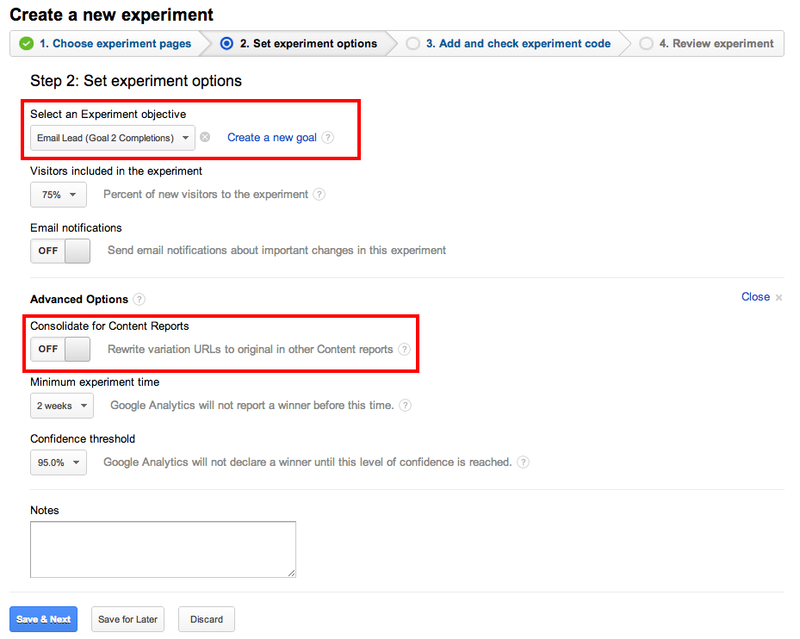 Click on Experiments under the Content Reporting section as shown below. 2. Enter the destination URL of the page you’re trying to improve. 3. 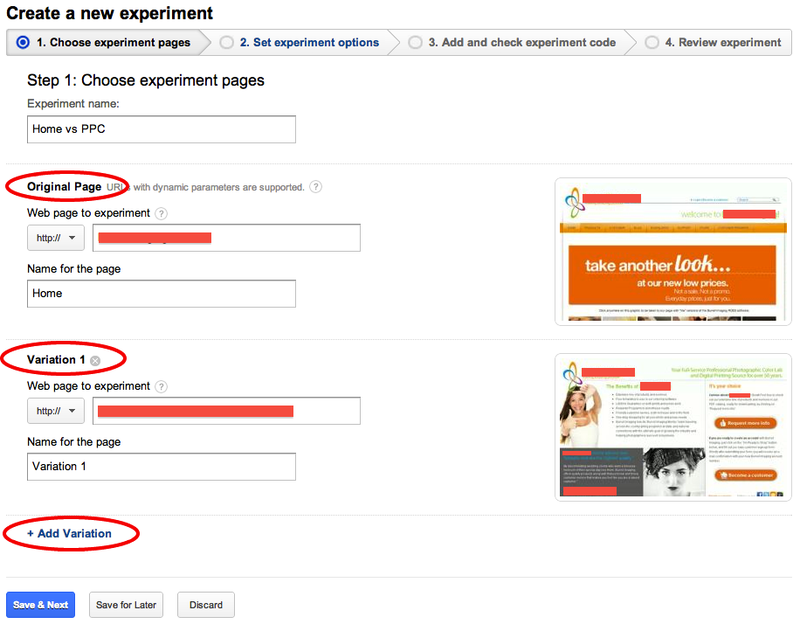 Give your experiment a name and enter the destination URLs for each page you want to test. 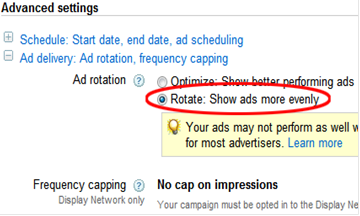 If you want to test more pages, simply click the Add Variation link at the bottom, as shown below. 4. Specify your experiment options. 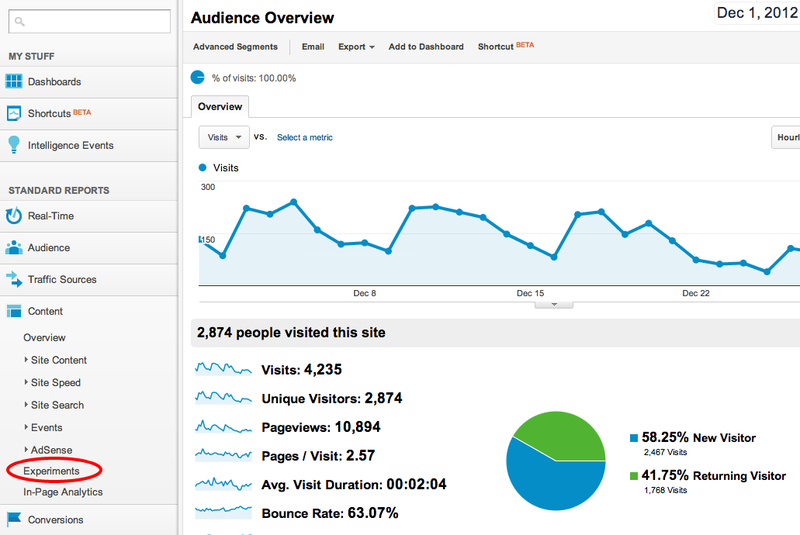 First, you need to select a KPI that Analytics can use to determine the results. In the example below, I’ve selected Email Leads. You also have the ability to decide how much traffic you want to participate, setup email notifications and more. 6. The last step in the setup process will check to make sure the code has been placed on your page. As shown below, you can see that the system has recognized the fact that my code hasn’t been placed yet. If you want to check this later, you can select the skip validation and continue link at the bottom. 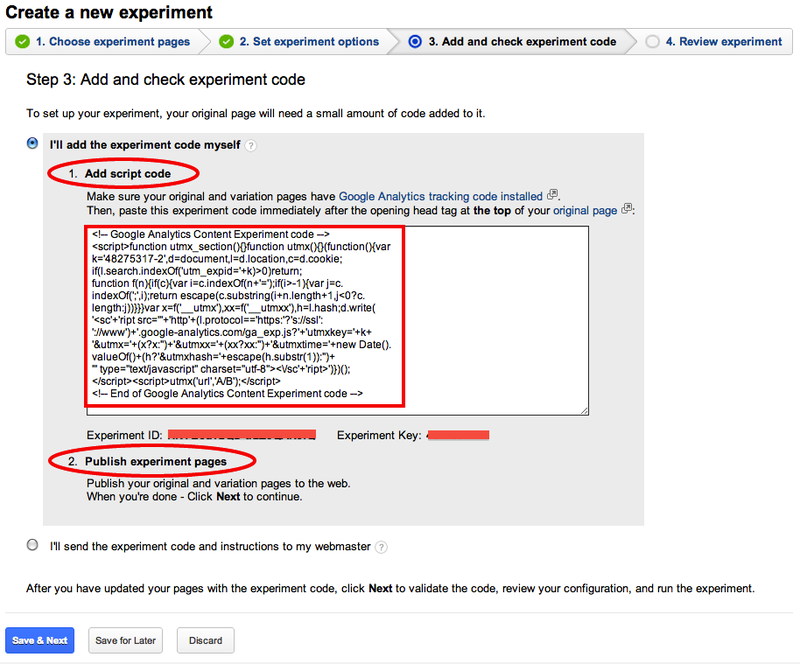 You can learn more about Analytics Content Experiments and other features for improving conversion rates here. Call-to-action buttons – Refers to the phrase that you use for the desired action (conversion) or the button that users click on to go to the next step in your conversion process. Items to test include size, shape, color, wording and more. Headlines - Should be relevant, timely and appropriate for your audience. Consider testing emotional vs. benefit-driven headlines or questions vs. statements, for example. Body Copy – Should also be relevant, timely and appropriate for your target audience, as well as sufficiently backup your headline. For example, you might try testing out shorter vs. longer text or paragraphs vs. bullet points. Images & Symbols – Images and symbols can also be nice compliments to a PPC landing page if used sparingly. Images should be engaging and help compliment the basis of the landing page itself. Symbols and certification badges are also helpful for building trust and credibility. For example, you might test different types of images or placements of your trust badges. Navigation – Adjusting the usability and navigational features of your website can also be worth testing. As a rule of thumb, it should be relatively easy to get around. If your mom can’t find her way around the site, there are probably others experiencing the same problem. Things to test include different placements of your navigation bar or the number of steps in your checkout process. 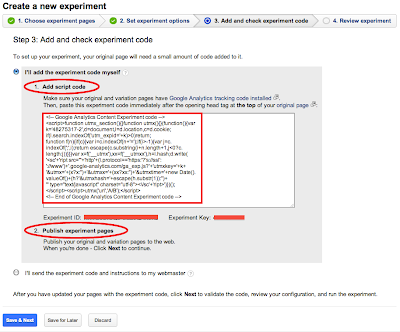 Different Pages – After you've tested some of the elements on your page, it might also be worth testing different pages against each other. 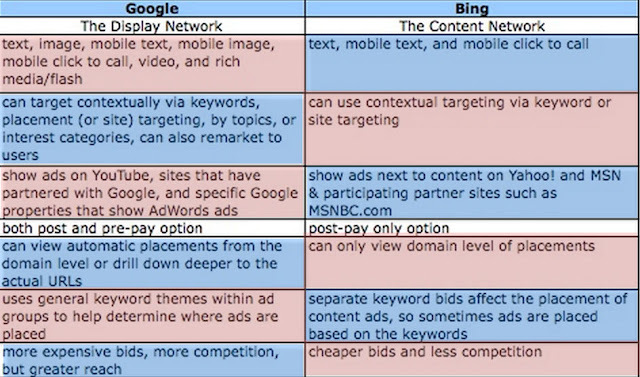 For example, you might consider testing your main homepage against a PPC-specific landing page or two different PPC-specific pages against one another. 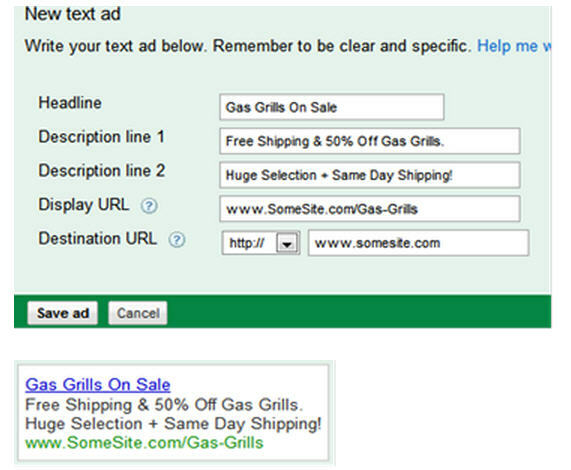 Promotions – Seasonal or time-sensitive offers are also worth testing on your landing page. These both create a sense of urgency that might help boost conversion rates. Whether it’s free shipping or 30% off all merchandise, benefits like these are attractive and can encourage visitors to take action.